Improving energy consumption is a constant theme within the cement sector in terms of both reducing the environmental footprint of operations and reducing the cost per tonne of production. Consuming between 20% and 30% of a plant’s power usage, depending on the type of mill used for raw material and cement grinding, fans represent a key area in which savings can be made. This article looks at a number of recent projects in which fan upgrades brought significant energy savings. Ash Grove Cement’s Durkee cement plant in Oregon, US, for example, recently upgraded its fan technology as part of a programme to improve energy performance. A key aspect of this programme was the installation of variable frequency drives (VFDs) on fans at the plant. VFDs were fitted on seven fans at the plant, with power ratings between 75 hp. and 200 hp. New line reactors were also installed. The VFDs and line reactors were supplied by Dykman Electrical Inc. of Boise, Idaho. In addition to scheduling the installation to minimise downtime, the plant also faced a learning curve in terms of running the new equipment within the process. This included the need to determine the new speed of the fans, as well as putting in place the proper preventative maintenance schedule – particularly as the cooling fans on the new VFDs require replacement every three years. Despite these early challenges, the new drives have reduced energy use in each fan by up to 50%. Coupled with the installation of a high-level supervisory computer system that maximises output per kilowatt-hour, and improved mill performance, the upgrade saw the plant awarded ENERGY STAR certification for 2016 by the US Environmental Protection Agency (EPA). ENERGY STAR certification marks a cement plant as among the most energy-efficient in the US, according to Jean Lupinacci, Chief of the ENERGY STAR’s commercial and industry branch. In addition to the ENERGY STAR certification in 2016, the plant also received the Ash Grove Energy Management award in 2011, 2013, and 2016. The Durkee plant began production in 1979, with an expansion in 1998. Plant production capacity now totals just over 1 million tpy of portland cement, with products including Type I, II, V and III portland cement. The plant serves markets that stretch from Portland, Oregon, in the west and Pocatello, Idaho, in the east. To the north, the plant supplies Tri-Cities and Spokane in Washington, and Edmonton, Canada, while in the south, its markets extend into Murray, Utah, and Reno, Nevada. It employs 112 directly and supports an additional 600 jobs. CalPortland’s Rillito cement plant in Arizona, US, is another that has recently taken advantage of the improvement in energy consumption that a fan upgrade can bring. This time the cooler fans were replaced as part of a clinker cooler upgrade project that would result in an energy efficiency rebate from Tucson Electric Power as part of the utility’s Commercial Energy Solutions programme. The new clinker cooler uses a range of new technologies to achieve energy efficiency goals, including new fans. Previous cooler fans were constant speed fans with louver controls for controlling the airflow rate. These fans were replaced with seven new variable speed fans, which increased efficiency by controlling the speed of the fan to control the airflow, resulting in a 10% – 20% improvement in energy consumption. The fan upgrade was coupled with upgrades to other crushing and conveying technology, and resulted in the plant receiving a US$71 212.70 rebate from TEP. Founded in 1891, CalPortland supplies construction materials, such as portland cement, ready-mixed concrete, asphalt and aggregates, to the western US. 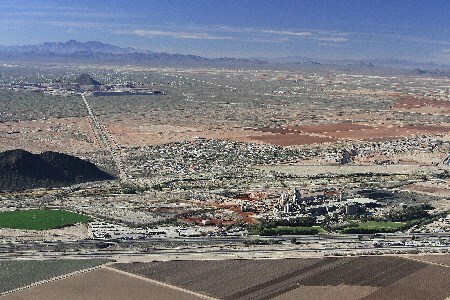 The Rillito plant began production in 1949, with a major expansion in the 1970s and upgrades in the 1980s and 1990s. The plant now has the capacity to provide 1.6 million tpy of cement to the Arizona construction market. On the other side of the Atlantic, Venti Oelde recently replaced two kiln exhaust fans at the Cemex cement plant in Prachovice, in the Czech Republic. Venti Oelde designed and manufactured the new fans, while its agent for the Czech and Slovak Republics, DSD Dostál a.s, co-ordinated the work and provided the necessary modifications to the inlet and outlet ducting. The timeframe for the work did not permit modifications to the existing foundations. Inlet and outlet ducts were adapted from the existing ducting system, although duct insulation was modernised. The project also encompassed the removal of the old fans, as well as the installation of their new high-performance replacements. The new fans are two double-inlet preheater fans, which each handle 398 000 m3/h of hot dust-laden gas. They were installed on schedule and have reduced energy consumption per tonne of clinker produced by 16%, according to Venti Oelde. Image: CalPortland’s Rillito plant, Arizona. Source: CalPortland. This article first appeared in the April 2017 issue of World Cement.